This commode chair is designed and manufactured using the finest quality raw material and latest techniques by our experts. Moreover, this commode chair is widely appreciated by our clients for its fine finish and durability. 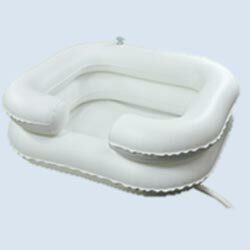 The inflatable shampoo basin helps provide the luxury of a shampoo for those confined to bed. The water reservoir incorporating a shower rose allows for thorough and easy rinsing. When complete, simply release the outlet hose, clamp and drain.